On the Internet, messages are meant to be heard. From high-powered advertising agencies to in-house marketing departments to individuals with a few hundred Twitter followers, everyone yearns for their message to be conveyed and shared. Finding a high-powered industry influencer can help jump start a sharing craze and kick your message into viral overdrive. A single retweet, blog link or public compliment can do more than you think. So what can you do to improve your chances of an influencer noticing and sharing your content online? Start by following the five simple rules below. 1. Don’t expect a social media miracle. Let’s start with an unfortunate truth for those on the hunt for influencers’ attention. Trying to reach out via social media likely won’t cut it. With anywhere from a few hundred to a few hundred thousand Twitter mentions and/or Facebook comments per day, influencers simply won’t have the time or opportunity to see your message. You can go ahead and try, but the chance of an influencer hearing you might be slimmer than winning the lottery. As for an in-person encounter -- forget it. You’d have to be in a situation as bizarre as that in season two of The Newsroom, when associate producer Maggie Jordan enlists the help of on-air talent Sloan Sabbith (along with her 450,000k+ twitter followers) to help take down an embarrassing viral video. 2. Instead, get creative to get an influencer’s ear. Since simple social media outreach likely won’t do the trick, you’ll need to find ways to get creative. Getting in touch with an influencer’s official PR agency or management team is a decent step, as is mining closer connections for an introduction. But for most influencers, making contact in a unique or innovative way can be key to the introduction. Consider a self-promoting website with plenty of personality similar to Matthew Epstein‘s brilliant Google Please Hire Me. 3. Show some passion! Hand in hand with showing off your creativity is finding a way to show insane amounts of passion for your work. Craft a pitch with just the right amount of passion and moxie so that the influencer you want to reach can’t say no. Venture for America, a program that pairs talented college grads with startups in burgeoning cities, asks this of their new fellows, most of whom are just weeks removed from receiving their diplomas. VFA’s “make contact” challenge saw one success story in a fellow who met with Dan Gilbert, CEO of Quicken Loans, by citing their mutual desire to rebuild Detroit. Another got in touch with Joe Kennedy, CEO of Pandora, by conveying his passion for companies at the intersection of tech and music. 4. Keep your content short and to the point. Obviously, your content needs to be razor sharp and engaging. More importantly, it needs to be easily digestible. Getting the attention of a major influencer is a difficult task by itself but convincing them to wade through a lengthy introduction or setup to get to your main point is simply asking to be ignored. The elevator pitch is a decent solution to this dilemma, but even that may be too long. Consider using various forms of micro-content to get your concept across in seconds. 5. Flattery never hurt anyone. Who doesn’t like compliments or a personalized pitch? Be sure to make any potential influencer feel good about why they should help you. Saying some nice words and having a good attitude is an incredibly low risk, high reward way to strike up a conversation with an influencer. A customizable, personal touch helped Visually make a splash when we first launched in 2011. We created theTwitterize Yourself tool, which helped us connect with an audience hungry for cool and engaging visual content. 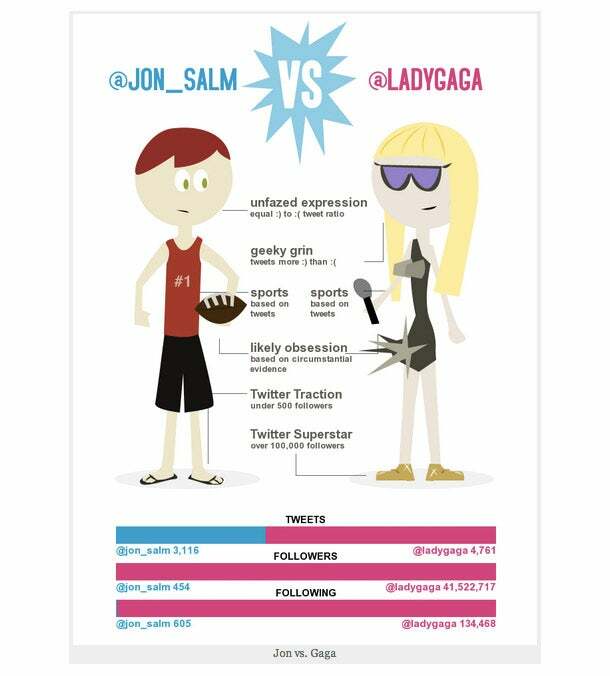 Here’s me vs. Lady Gaga. (Even though I know this isn’t a close comparison, nor do I look very cool, I still can’t help but crack a smile.) And while the real Lady Gaga most likely never saw my graphic and never will, the media and industry influencers did take note and helped us spread the word.